Enforcement of the final rule in general industry and maritime is scheduled to begin next June. Employers in the construction industry should refer to a similar guide for Construction. On December 22, 2017, OSHA's silica rule survived a court challenge and remains in effect, with a three-judge panel rejecting all five objections raised by industry groups. The U.S. Chamber said it is reviewing the decision, adding that "we continue to believe that OSHA lacks substantial evidence to support its rule." Download the new general industry and maritime guide (pdf). Download the revised silica guide for construction (pdf). 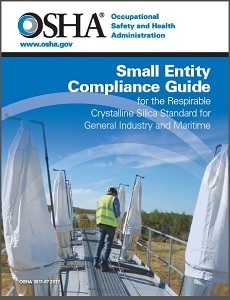 Visit the OSHA Crystalline Silica page. Browse Respirator PPE safety signs and labels.